Welcome and thank you for visiting the premier website of the Advanced Specialized Laser Center™, a Leading Center for Innovative Patient Care, Physician Training and Laser Research. We’re confident that our dermatologist in Clearwater, FL will help you find the solution to your clinical problem at our office. The Advanced Specialized Laser Center™ is enormously proud of Dr. Nemeth’s almost 30 YEAR Experience in mastering the use of Specialized Lasers since they first became available. Since 1992, after moving from Miami after Hurricane Andrew, Dr. Nemeth has strived to provide the best possible dermatological care coupled with a genuine concern for our patients in the Tampa Bay area as well as patients who have come from throughout Florida, the United States, and Internationally. Web Sites are like automation, useful for a brief introduction but unable to fulfill the absolute need for direct patient-physician interaction and dialogue about needs, concerns, and reality. 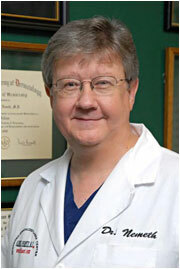 Dr. Nemeth greets, sees, examines and interacts with every single patient each and every time! No Exceptions!! Dr. Nemeth treats EVERY SINGLE PATIENT EACH and EVERY TIME! EVERY and ALL PROCEDURES! No Exceptions!! Some of our services include spider veins, birthmark removal, vascular lesions, and rosacea treatment in Clearwater, FL. We are certain you will find some of the information here useful. As you navigate the site, you will also find information about the Advanced Specialized Laser Center™'s logistics: Our Clearwater office location, hours, forms, and appointment scheduling. Our staff is dedicated to making your visit as comfortable as possible. You can schedule an appointment from this website. But why not speak directly to real human beings: Diane, Janet, and Nancy are most helpful, friendly and engaging - call (727) 799-5273 Today! We very much look forward to welcoming you to our office. Dr. Nemeth is a Board Certified Dermatologist certified by the American Board of Dermatology, and is the Director of the Advanced Specialized Laser Center™ in Clearwater, Florida, USA which he founded in 1993.